Huge pallasite at Brenham strewnfield: The author (above left) and his hunting partner, Steve Arnold, with a 230-lb pallasite from the famous Brenham, Kansas strewnfield. 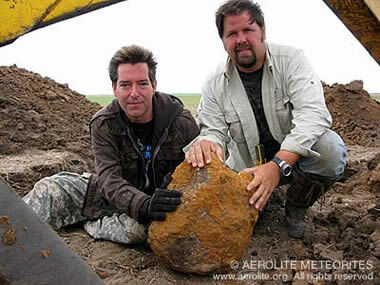 The mass was discovered by us while filming the Science Channel documentary "Meteorite Men" in the fall of 2008. The meteorite was deeply buried and so large and unwieldy that it had to be lifted out of its excavation pit in the bucket of a backhoe. 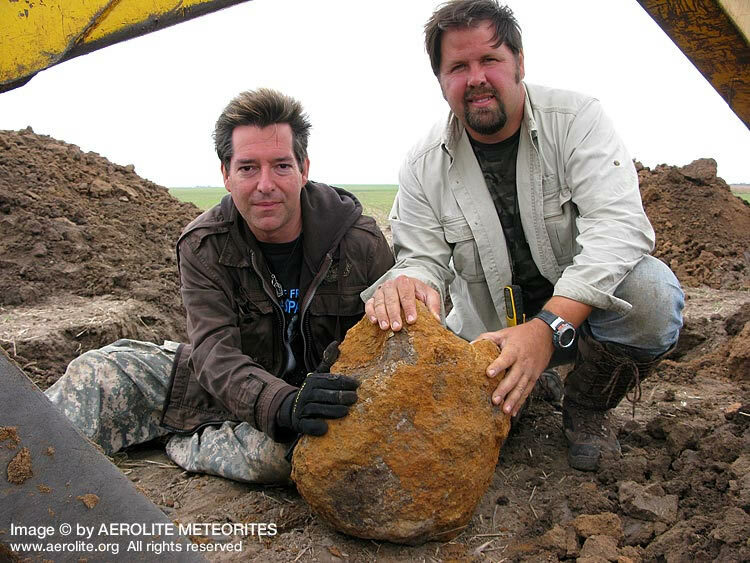 In terms of size and weight, this meteorite is in the top 1% of all specimens ever recovered on Earth. 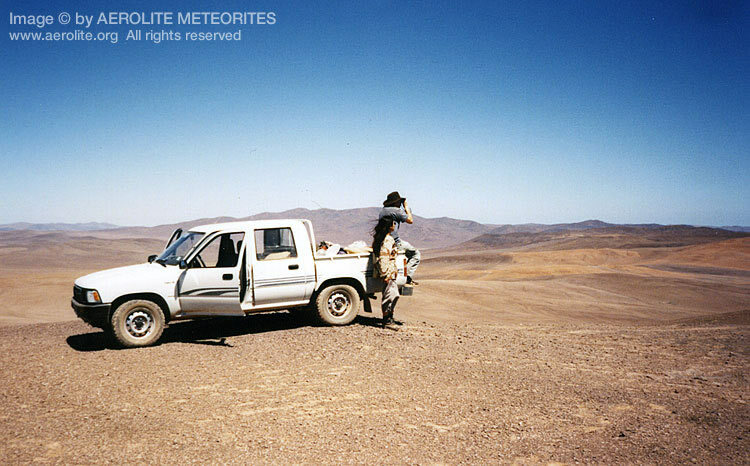 Photograph by Caroline Palmer, copyright Aerolite Meteorites. Click to enlarge. In the second episode of Meteorwritings, "Meteorite Types and Classification," we presented an overview of the three main groups of space rocks: irons, stones, and stony-irons. This month we take a more detailed look at the rarest and most unusual of those groups-the stony-irons-examine how they were formed, and will consider some important examples. Esquel pallasite: A part slice of the lovely Esquel pallasite from Chubut, Argentina. 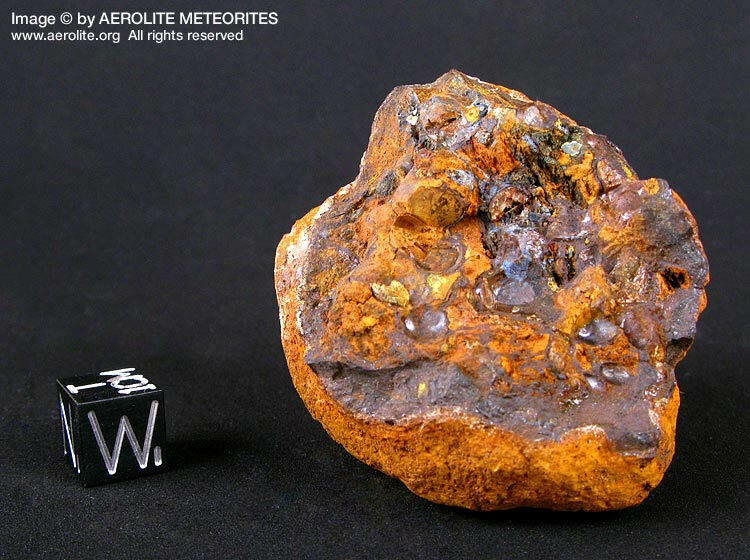 The large, colorful, oblong crystals are typical of this meteorite. Note the way in which crystals near the rough (natural) edge have turned orange and yellow due to terrestrial weathering, while the crystals nearer to the center of the original mass have retained their true olive green color. Photograph by Geoffrey Notkin, copyright Aerolite Meteorites. Click to enlarge. 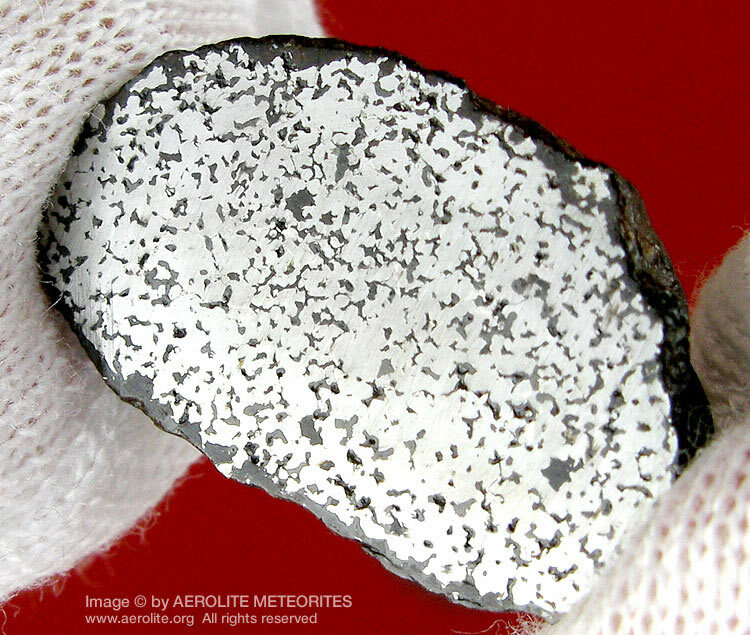 As discussed in previous editions of Meteorwritings, iron meteorites are composed primarily of iron and nickel, and once formed part of the core of planets or large asteroids. Stones are the most abundant type of meteorite, and most once comprised part of the crust of bodies within the Asteroid Belt. 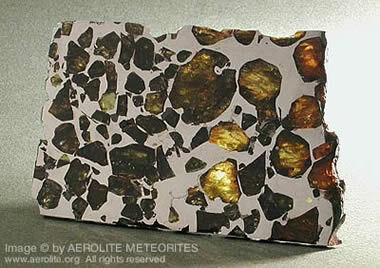 Although many contain flecks of extraterrestrial nickel-iron as well as chondrules they do, in many respects, look similar to terrestrial rocks. 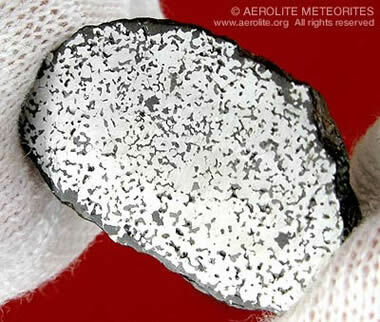 Compared to the other two main groups, stony-irons are extremely rare, making up less than 2% of all known meteorites. They contain roughly equal parts of the other two classes. In other words, stony-irons consist of a mixture of nickel-iron and silicates. Imilac pallasite: Detail from a large full slice of the Imilac pallasite from Chile's Atacama Desert, weighing 174.5 grams. Note the angular, translucent olivine crystals (the gemstone peridot). Imilac is a sturdy and stable pallasite, and when cut and polished by an expert preparator slices can be made thin enough to allow light to pour through the crystals. Area pictured is approximately 95 mmx 60 mm. Photograph by Leigh Anne DelRay, copyright Aerolite Meteorites. Click to enlarge. The stony-irons are divided into two groups: pallasites and mesosiderites. Originally thought to be similar in origin and composition, the two types of stony-irons are now believed to have formed in very different ways, and are combined in a single group not so much because of their similarity to each other, but rather because they are so different from other meteorites. 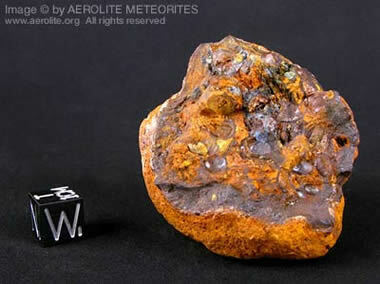 Mesosiderite: A small individual of the mesosiderite known as Northwest Africa (NWA) 2932. This specimen was found in the Sahara Desert and has been cut and polished to reveal its makeup of iron and silicates. The shiny metallic matrix is peppered with darker silicate inclusions. Area pictured is approximately 25 mm x 15 mm. Photograph by Leigh Anne DelRay, copyright Aerolite Meteorites. Click to enlarge. Weathered Brenham meteorite: A highly weathered example of a small Brenham meteorite with a broken face. This specimen has an interesting history: It was recovered in the 1930s in Brenham, Kansas during an expedition by the pioneering American meteorite researcher and hunter, H.H. Nininger. This piece was part of a large collection that Nininger sold to the Natural History Museum in London after he retired from meteorite hunting. I later acquired the piece in an institutional trade with the NHM and brought it back to the United States. This Brenham piece was found in a damp, muddy part of the strewnfield and much of the iron-nickel has terrestrialized, while the olivine crystals remain intact. Corroded specimens such as this are unofficially called meteorodes. Photograph by Leigh Anne DelRay, copyright Aerolite Meteorites. Click to enlarge. In 1902 a 45-kg meteorite known as Marjalahti fell in the Respublika Kareliya in Russia. It is one of only three witnessed-fall pallasites in existence. 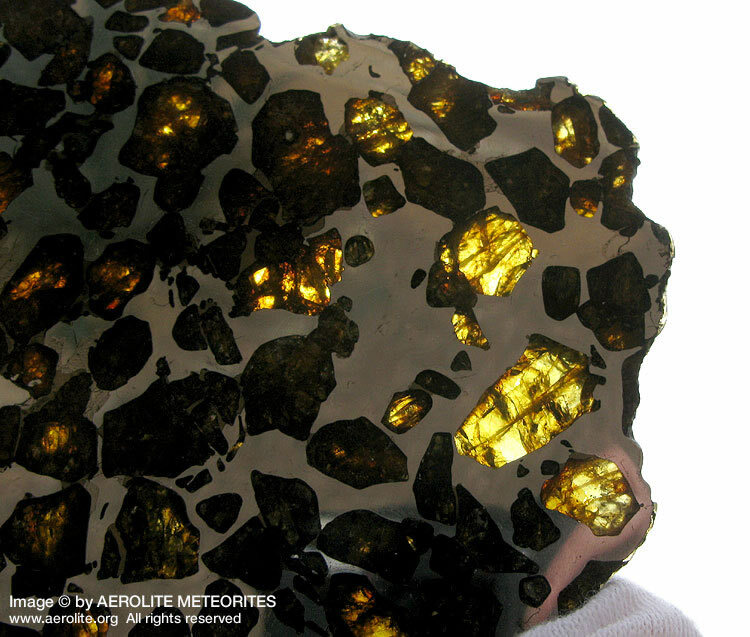 After the meteorite was recovered and examined, the olivine crystals it contained were determined to be of such a high quality that gems from the Marjalahti pallasite were adopted as the official standard for peridot. So, extraterrestrial crystals that originated in outer space set the benchmark for terrestrial peridot gems. Once the excellent quality of Marjalahti peridot became known to gemologists, many crystals were removed from sliced meteorite sections for study, and very few pristine specimens remain. Marjalahti is rarely offered on the collectors' market and examples may fetch anywhere from $40 to $100 per gram. Pallasites can be thought of as an immiscible emulsion, like oil and water. During differentiation, fractional crystallization should separate the two major minerals . olivine is an ultramafic mineral that forms and accumulates deep within an asteroid body. We can imagine it gathering as a cumulate layer at the core/mantle boundary. Pallasites were likely created in a comparatively small zone within these differentiated asteroids, and that fact may explain their rarity. 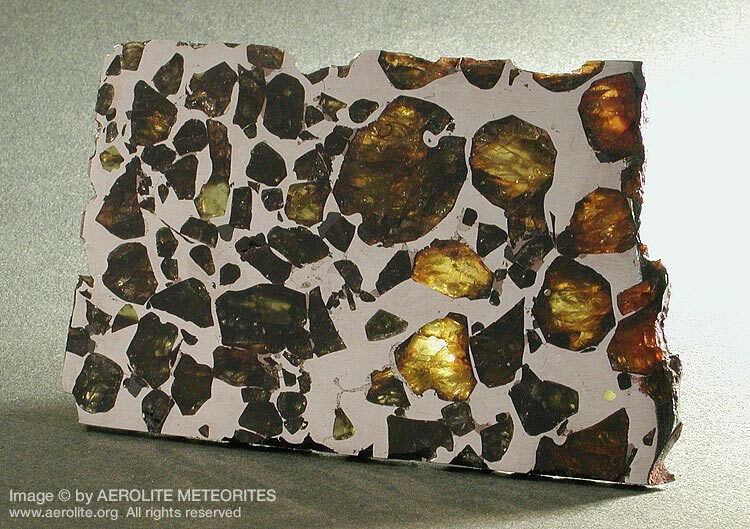 Out of the many thousands of identified meteorites there are only about 45 known pallasites. Vaca Muerta strewnfield: The author scans the Vaca Muerta strewnfield with binoculars during our 1997 expedition across Chile's Atacama Desert. It is one of the most barren deserts on earth, with almost no plant or animal life. The open, light colored surfaces are ideal for rockhounding, and the Atacama has produced numerous meteorite finds. 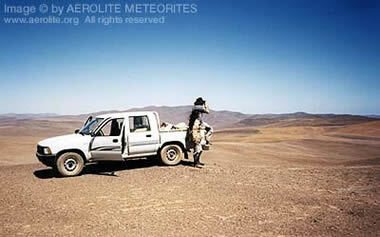 Photograph by Steve Arnold, copyright Aerolite Meteorites. Click to enlarge. During the period of planet formation, mesosiderites originated by the low-velocity collisions of large metallic core fragments with the surface of a differentiated asteroid-size body . these collisions reduced mantles and crusts to small silicate fragments but left cores in the form of large, durable metal fragments. Mesosiderite specimens: A collection of mesosiderite specimens from the Vaca Muerta strewnfield in Chile. Note the yellow and orange oxidation on the individual fragments. The piece top center has been cut and polished to reveal an exotic and shiny interior, which was initially mistaken for silver by 19th Century prospectors. Photograph by Leigh Anne DelRay, copyright Aerolite Meteorites. Click to enlarge. The high Atacama Desert in northern Chile is one of the driest and most desolate places on Earth. NASA tested an early prototype of the Mars rover there because the terrain was the closest match available for the Red Planet. In 1822 prospectors discovered several large masses of the Imilac pallasite sitting in shallow impact pits. Nearby, they came across a compact strewnfield containing thousands of small pieces in close proximity. The surface of the Imilac meteorites showed considerable weathering, suggesting an old fall, and many olivine crystals had been sandblasted away by the desert wind, leaving behind small skeleton-like iron fragments. When cut and polished, the larger pieces revealed gorgeous green and gold angular crystals, unaffected by terrestrial weathering. Imilac is an extremely stable meteorite and can be prepared into thin and strikingly beautiful slices that are highly translucent and appear to glow in natural sunlight. In 1997 I made the long and difficult journey to Imilac, and several other meteorites sites in Chile, with my hunting partner Steve Arnold. We recovered many specimens, and Meteorite magazine published an account of our adventure, "Hard Road to Imilac," in 1998. Imilac is not the only well known meteorite to have been discovered in the Atacama. In 1861, prospectors in search of precious metals found several heavy iron-like rocks. After breaking a few of the masses open and studying their glittering interiors, the prospectors mistook the stones for silver ore. When the masses were later identified as meteorites and classified as a mesosiderite they were given the name Vaca Muerta ("dead cow" in Spanish). 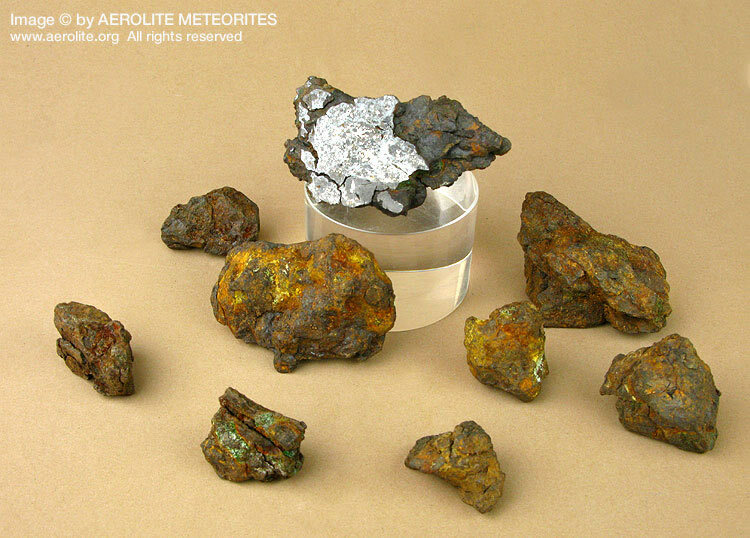 Many specimens have been recovered in the intervening years, and Vaca Muerta is the mesosiderite most frequently represented in private meteorite collections. Meteorites are typically named after the town nearest their point of discovery, but there are no towns in that part of the Atacama. During our 1997 expedition, Steve and I spent some time hunting in the large strewnfield, and it is still possible to find the location where the prospectors first examined the Vaca Muerta meteorites. Near the prospectors' old camp we stumbled upon an ancient sun-bleached cow skeleton, and concluded that it may well have been the origin of the meteorite's name. We searched the immediate area with metal detectors, and Steve quickly located a strong target, buried under some of the bones. We hurriedly dug into the sand above the target and were somewhat disappointed to find an old horseshoe. "They even got the name of the meteorite wrong," Steve exclaimed. I agreed, and suggested it should perhaps be renamed Caballo Muerte ("Dead horse"). Perhaps the most popular pallasite among collectors, Esquel is prized for its large, rectangular, deep green crystals. A single mass weighing 755 kg was recovered in Chubut in the Patagonian Territory of Argentina in 1951 or possibly earlier. The mass was cut into a few pieces and purchased by meteorite collectors from Argentina and the United States. An impressive full slice of Esquel is today displayed in the Rose Center for Earth and Space in New York City. Due to its stability and richly colored crystals, specimens of Esquel are sometimes used by jewelers to fashion pendants. During the 1880s a frontier farmer named Eliza Kimberly collected roughly one ton of rocks from her family's homestead and although her husband thought she was crazy, she insisted that the dark, heavy stones were meteorites. In 1890, Professor Cragin, a geologist from Washburn University, confirmed that her rocks were, indeed, meteorites and purchased several specimens from her. Celebrated meteorite hunter H.H. Nininger found many specimens at Brenham during the 1930s and H.O. Stockwell, an amateur geologist from Hutchinson, Kansas, uncovered a 1,000-pound mass there in 1947. 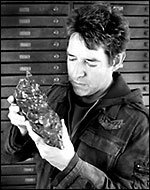 In 2005 Steve Arnold visited the Brenham site with a specialized meteorite detector he designed himself, and found a 1,430-lb pallasite-the largest ever recovered in the United States. Steve and I went on to work at Brenham for several years. We unearthed numerous large masses and used the Brenham strewnfield as a filming location for several television documentaries including The Best Places to Find Cash & Treasures and the PBS series Wired Science. Brenham is often described as a "classic American meteorite" and is often seen in private collections and museum displays. The Brenham pallasite is packed with small, oval crystals and typically sells for about $4 per gram, making it one of the most affordable pallasites to collectors, and roughly one tenth the price of Esquel. Pallasites and mesosiderites may be the odd couple of the meteorite world, but their unusual makeup provides us with some valuable clues about the early days of our Solar System, and gives us a glimpse into the processes at work inside ancient asteroids.